Meet some of the volunteers who are helping our paper grow and find out how you can get involved. 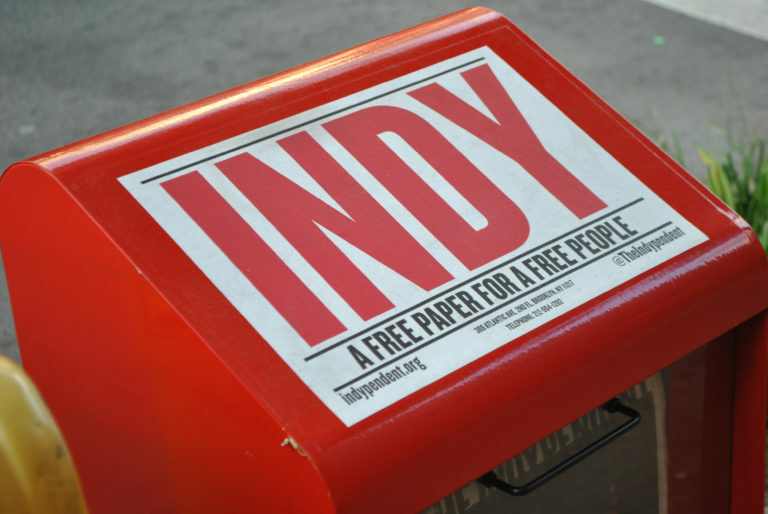 The Indypendent has placed dozens of outdoor news boxes around the city since last fall. Our circulation has jumped to 30,000 papers a month. None of this would be possible without the help of volunteers who maintain our boxes and find new venues where the paper can be shared. 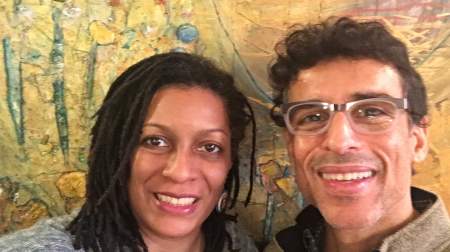 Here are some of the first-person stories of the volunteers helping us build a grassroots media revolution. 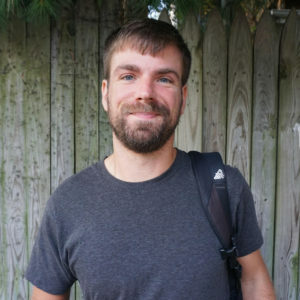 I am a freelance computer programmer who also makes maps for nonprofits that want to better understand what is happening in their neighborhoods. I’ve followed The Indypendent six years. There’s a demand for progressive news like The Indy that has both good local stories and national stories that are in a local context. After the election, I was definitely looking for small things I could do in an everyday way. So in December, I started maintaining a new Indy street box located in front of the Cortelyou Road subway station. The area has a pretty dense, diverse mix of people out on the street most of the time. I think that’s part of why the box is doing well. People see it and discover it while they’re walking down the street. The probability of you running into that newspaper box is much higher than you stumbling upon the publication online. it opens the paper up to such a different audience than it would get otherwise. I check on the box every couple of days on my way to the train or the grocery store. I’ve never paid this much attention to about four square feet of sidewalk in New York City! Half the time there isn’t anything to do. Every once in awhile somebody will leave a soda bottle in the box or the papers need to be reshuffled. For that amount of work, I think the reward of knowing that you’re bringing access to a different kind of the news to your immediate neighborhood is really rewarding. I used to subscribe to the old (U.S.) Guardian newspaper, a radical newsweekly that folded in the early 1990s. It taught me a whole lot about the world. These days, I consider The Indypendent to be essential reading. I went to law school because I wanted to work for social justice. But there’s only so much you can do as a lawyer. 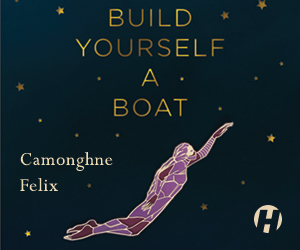 You have to build a mass movement. I have lived in Fort Greene for about 30 years, long before it was described as a “good neighborhood.” There are still a lot of progressive-minded people in Fort Greene so I’m quite happy to have a box on my corner next to our neighborhood subway station. I visit the box every weekend and make sure the papers are crisp and attractive. I find other ways to get the paper out as well. I usually bring copies to National Lawyers Guild meetings where they are very well-received and to meetings of feminist groups I am active in. I also make a point of dropping off a number of copies in the jury room of the Kings County Supreme Court building on days when hundreds of people are called in for questioning to see if they would qualify to serve on a jury. There are a lot of bored and unhappy people there, so why not give them a chance to read a free paper for free people! Hunter College is the embodiment of working-class, immigrant, melting pot New York that The Indy needs to reach. I’m a junior there, majoring in political science and have been aware of The Indy for a number years. Its coverage of local stories from a left perspective is really important to me. 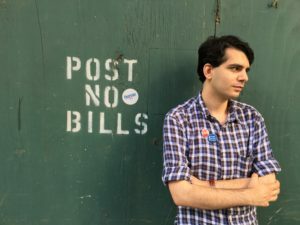 After being heavily involved in the Bernie Sanders campaign, I thought it was important to become more active on the left in New York. The Indy presented a great opportunity to do that. I take care of a box at 68th and Lexington where Hunter’s campus is located. I visit the box twice a week and also leave a stack of papers near the student government office. In addition, I’m a co-chair of the NYC Young Democratic Socialists and am actively involved with the Democratic Socialists of America. I pass the paper out at our meetings and whenever else I get the opportunity. The Upper East Side is characterized in a very bourgeois way but it really does have a diverse array of people who live and work in it, so it’s important to have a presence there as well. 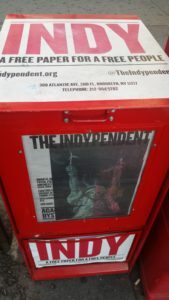 Adopt an Indy newsbox in your neighborhood or by your subway station. It only requires a few minutes of your time each week to maintain a neat and orderly box. Get permission to place The Indy at venues in your neighborhood/school/workplace, or take the paper with you to events or meetings to share with others. 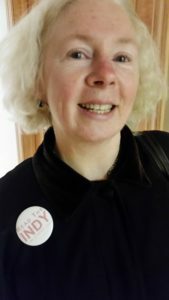 Go to indypendent.org/donate and sign up to become a recurring monthly donor or make a one-time contribution. If Donald Trump has taught us anything, it’s the value of a free and independent press. Step up bigly and sponsor a shiny new Indy news box with a $250 contribution. It’s a great way to help make The Indy available to your neighbors every month. 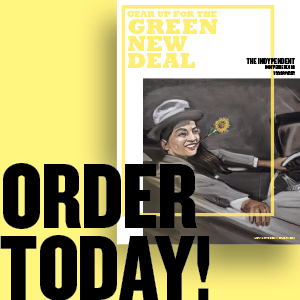 Go all in and contribute an additional $500 to fill your own Indy news box with 400 papers every month for a full year. You will be an independent media hero! To get involved, email contact@indypendent.org or call us at 212-904-1282.